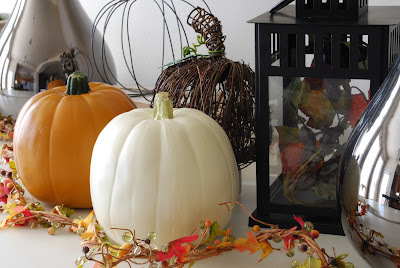 This year, since we are in the middle of decorating basically the entire house, I decided to go simple with the autumn decor. But since autumn is also my favorite season of the year, I certainly couldn't let it go by without paying it a little homage. And since we moved to a new place, we no longer have a fireplace mantle to dress up with the seasons, so I have chosen, instead, to dress the top of my white buffet. 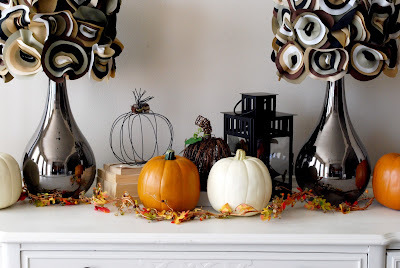 Luckily my pretty Homegoods lamps (I always have people ask where I got them, so I figured I'd throw it out there to save anyone who might want to know the effort of having to ask...LOL) look very autumn-ish with their lovely earthy shades, and so lent themselves well to the display. 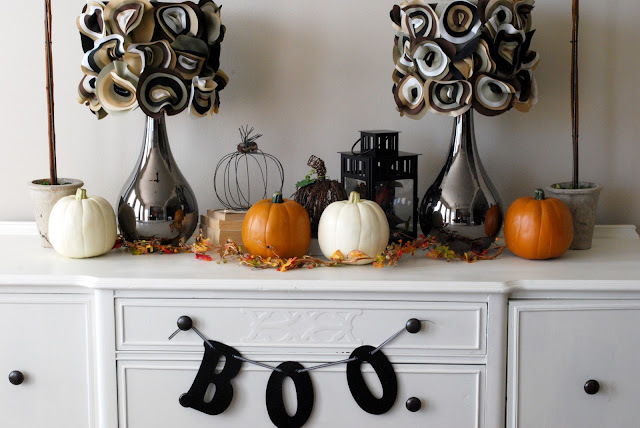 Then all I did was round up a bunch of my faux pumpkins and plop them on the buffet. Okay, I put a little more thought into it than that. :-) I placed the wire pumpkin on top of a stack of old books tied with twine, added in some pretty fall garland, and filled the lantern that usually sits on the dining room table with a bit more garland for a little interest. I love the mix of textures, and the pop of color from the garland. Simple. But pretty. I'm lovin' this touch of autumn. I'm linking up to the fun at The Lettered Cottage! Love it...those lamps are beautiful! I love simple displays! Sometimes some is just right! Very cool. I love those lampshades! These lamps are amazing and they look perfect on your mantel with the pumpkins. They are so fun. I'd love it if you stopped by and linked this up to my party that started today. So cute! The wire pumpkin is adorable! All of it is! Visiting from Kevin and Layla's! It all looks lovely Wendy! Those lamps are amazing. And the little wire pumpkin looks like my next DIY. = ) Thanks for sharing. Hope you're having a great week. Wow! I love your lamps. Your display is gorgeous. It looks beautiful Wendy! You have such a great eye for detail! I love your lampshades!! They are perfect for the decorations! It looks so rustic and fall with the orange, black, and white combo! Hi, this is such a pretty display. Love the lamps for sure, but the arrangement of everything has inspired me to try this out on my sidebar. Thanks, and Happy Fall! Ok, I was feeling a bit cross that my mantle is STILL not installed and I wasn't going to be able to primp. As usual, you found a solution and have given me a bit of a smack to get me on track. Beautiful! And those lampshades, oh my! Textures! 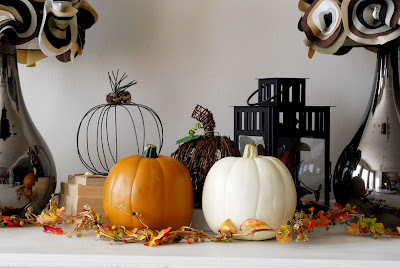 Love the different pumpkins. LOVE the lampshades - they are from Homegoods too? We are in a new house sans mantle this year too and I enjoyed the challenge of finding that focal point to decorate - you did a great job! I remember that jack-o-lantern book you posted a couple years ago. I remember making it because it was so simple and so fun to make. I love your ideas.